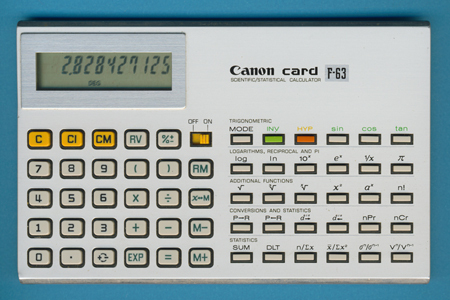 Size: 3.5" x 5.6" x 0.25"
The Canon card F-63 Scientific/Statistical calculator was introduced together with the F-72 in 1980. Both calculators sport a total of 59 keys compared with the 40 to 45 keys of similar products. Dismantling the Canon card F-63 is time consuming, we noticed more than 20 tiny screws. This Canon card F-63 was manufactured end of 1980 and is centered around a Toshiba T3801S single-chip calculator circuit. Mike Sebastian's "Calculator forensics" reveals for the Toshiba T3801S chip a fairly good result of 9.0000278593, known from later calculators, e.g. the Toshiba SLC-8310, TI-35 Solar and even the first generation of the TI-30 Galaxy introduced in 1984. © Joerg Woerner, January 17, 2010. No reprints without written permission.